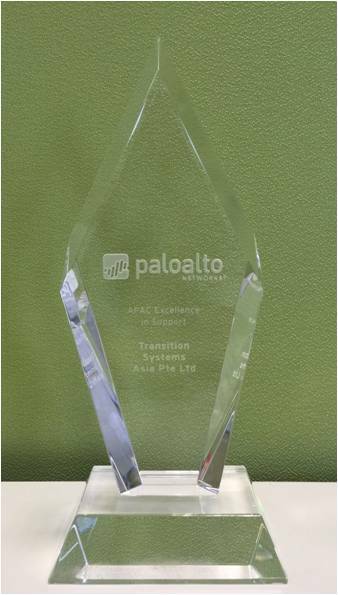 SINGAPORE, 22ND September 2015 - Transition Systems Group, the leading Value Added IT Distributor is awarded Palo Alto Network’s Excellence in Support Award, during its Global Partner Summit in Las Vegas, USA, last August 2015. “In view of Transition Systems’ outstanding support performance, it is our great pleasure to announce them as our Elite Authorized Suppot Center – APAC,” said James Lim, Partner Services Program Manager, APAC (Palo Alto Networks) “We appreciate the efforts and commitments so far and we look forward to working with them in the next level”. This new status enables Transition’s Support team early access to new technical releases, trainings, tools, direct access to senior Palo Alto Networks TAC Engineers and also a seat in ASC Advisory Council. Transition’s Partners and their customers can now be even more confident working with Transition’s support team. Palo Alto Networks is the next-generation security company, leading a new era in cybersecurity by safely enabling applications and preventing cyber breaches for thousands of organizations worldwide. Built with an innovative approach and highly differentiated cyber threat prevention capabilities, our game-changing security platform delivers security far superior to legacy or point products, safely enables daily business operations, and protects an organization¹s most valuable assets. Find out more at www.paloaltonetworks.com.